Adoption Profile - Hopeful adoptive parents, VC and JP, wish to adopt a baby. Hello and thank you for taking the time to get to know us. From day one, parenting has been the most rewarding journey we have taken in our lives. We value diversity of experiences, people in our child's life, activities and cultures. We look forward to welcoming your little one into our fun-filled, laughter filled, silly and loving community of family and friends who are all important and will play a role in supporting and nurturing your child's growth. Education: JP - Ithaca College and Antioch University. VC - University of Utah and Currently enrolled in Cornell online classes. We promise to nurture all of your child's interests. We promise to love and laugh. We promise to explore the world with your child. We promise to prioritize education and financial security for your child. We promise to surround your child with diversity. We promise to stay open to all forms of communication with you over the years. We promise s/he will brush their teeth every night. We promise balance - in love and support, in safety and challenges, sports and art, silliness and seriousness. We jokingly tell people we met on Craigslist, which is partially true. JP was living in a house on Capitol Hill with 4 other people and one moved out. We posted the room on Craigslist and the first person we interviewed was VC. We hit it off instantly as we talked and joked about riding bikes, backgammon and Sponge Bob. I thought to myself, "Yeah, this will work" and convinced my roommates to select VC. We became instant friends through rock climbing and VC helping me through my first year teaching. We spent a lot of time together and after I moved out of the house several months later, started dating instantly. Over the next several years, we had our ups and downs; lived together, traveled, loved, fought, broke up and then found each other again. We married in 2012 and the adventure has continued. 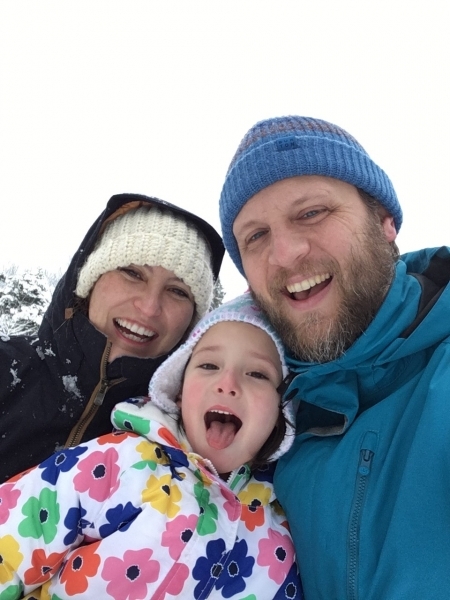 Our daughter, Effie, was born in 2014 and nothing makes us happier than being a loving and adventurous family. And yes, we both go by our initials, which we did even before we met. Babcia’s visit and ice cream!! Grandma is visiting, So me and VC rented a beach house for the weekend!! So. Relaxing. Hope everyone out there is doing well.